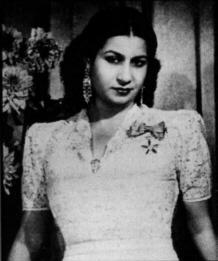 Um Kulthum in the 1947 film Fatmah. Zikrayat is a New York ensemble that draws its repertoire from the golden age of the Egyptian film musical, circa 1940s-1960s. On this show, Sami takes us on a very well-informed musical journey through the heyday of Egyptian musical film. Zikrayat will be performing their take on this music - with accompanying clips from the films - in a free concert at CUNY's Elebash Recital Hall, 365 Fifth Ave in midtown Manhattan, Thursday May 15 at 7:30pm. Info: http://web.gc.cuny.edu/Music/events/CoW2008SeriesFlyerR022008.pdf. Info on these and future Zikrayat shows at the band’s home page http://www.zikrayatmusic.com or myspace page http://myspace.com/zikrayatmusic. You can also get Zikrayat's cd "Live at Lotus" here: http://cdbaby.com/cd/zikrayat. An excellent (and longstanding - since 1934!) source for buying cds of and subtitled DVDs from Egypt's golden age of film - and Middle Eastern music in general - is Rashid Sales: http://www.rashid.com/. Or visit their shop at 155 Court Street in Brooklyn, NY. The Arabic Channel - channel 507 on Time Warner Manhattan cable - often shows classic Egyptian films. And you can find some of the films via mainstream DVD renters such as Netflix or even some in circulation at branches of the New York Public Library. Hi Rob! I walked around Branch Brook Park and checked out the mass profusion of cherry blossoms while listening to this show on an old Walkman. This show was amazing! I will be there May 15th!